The Nahargarh Fort was built by Sawai Raja Jai Singh in 1734. Since Jaipur was his capital, the Nahargarh Fort was strategically important and was built as a means of bolstering the protection of Amer. It was also known as the Tiger Fort. New additions were made to the fort in the 19th century by Sawai Ram Singh II and Sawai Madho Singh II. The older parts of he fort are being thumped by the ravages of times but the newer additions are quite charismatic. According to a legend, the Fort was christened Nahargarh after a deceased prince whose spirit used to irk the site and would cause mischief so as to delay the construction of the fort. After too many disturbances, finally after a Tantrik (holy man) performing his rites prayer, agreed to leave on the condition that the fort should be named after him. Later a shrine was also added where the warrior could be worshipped. Nahargarh was used as the treasure of the Jaipur kingdom and even the highest state officials would only be allowed to approach the fort blindfolded. The Nahargarh Fort in Jaipur offers some extravagant views, especially it looks very dazzling with floodlit at night. 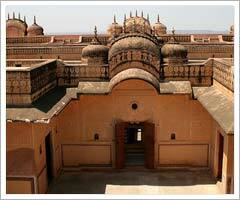 There are many historical buildings located within the Nahargarh Fort. Of all these, the Madhavendra Bhavan is the most maneuver as it houses nine inter connected apartments of Maharaja’s nine wives. The term Nahargarh means ‘the abode of tiger’.